The fall season is just a preview of things to come for many as it focuses more on the individuals than the team, but it is not without some great competitions. Taking a look at some of the highlights will give us a preview into things to come in the spring season that begins in January 2009. With two of the majors taking place, the fall season can't be discounted in Division I. The ITA D'Novo Men's All American Championships saw the SEC take the lead as LSU's Michael Venus took the singles crown and doubles went to the Ole Miss duo of Jonas Berg & Bram ten Berge. At the Riveriera All American Championships, Arizona State sophomore Kelcy McKenna was the singles winner and qualifiers Irina Falconi & Amanda McDowell of Georgia Tech were the doubles winners. In addition to Irina Falconi's All American win is one many new freshman faces have also been making a showing: Florida's Carlos Cueto claimed the singles championship at the Seminole Invitational; Notre Dame's Kristy Frilling won the Gator Fall Classic; Michigan's Jason Jung won his first collegiate event at the Wolverine Invitational; And Stacey Lee of Northwestern was the winner at the Wildcat Fall Invitational. NCAA Division I Fall Rankings will be released on January 6th. On the women's side, it's Armstrong Atlantic once again leading the pack. The school swept the NCAA Championships last year and are poised for another run. At the end of the Fall, they claimed the No. 1 spot in both men's and women's team rankings as well as singles, with Sona Novakova leading the women and Eudaldo Bonet. Sona and Eudaldo were both the NCAA Division II winners at the ITA National Small College Championships. Consistency is also the case in NCAA Division III where the defending champion Williams women and Washington-St. Louis are the top-ranked teams. (Individual rankings have not been released.) Neither team produced a winner at the Small College Championships where John Kauss of Gustavus Adolphus and Jennifer Kung of the University of Chicago won the Division III draws. 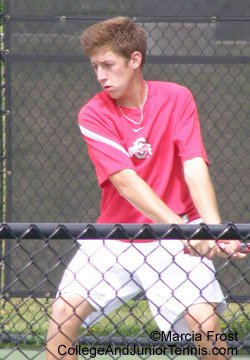 NAIA led the Small College Championships in 2008. Auburn-Montgomery's Delia Sescioreanu earned her top ranking in singles and doubles. The junior from Romania was the single and doubles winner (with Tereza Ververkova) in the Superbowl. It was also an Auburn-Montgomery team, Michael Johnson & Monte Tucker, who took men's doubles, but singles went to Fabio Silva of Fresno Pacific. The Hillsborough women are on top once again with Olivia Howlett leading women's singles (no team rankings has been released). Last year's men's leaders, Laredo, is the current No. 1 ranked team with Cledson DeCarvalho on top of singles and doubles with partner Moacir Santos (who happens to also be the No. 2 singles player). The fall season ended with the International Collegiate Competition December 4-7 in Poitiers, France. The teams of Americans were led by University of Illinois women's coach Michelle Dasso and Claremont-Mudd-Scripps College's men's coach Paul Settles. Competing for the U.S. was John Kauss, Gustavus Adolphus College; Amanda Fink, University of Southern California; Nate Schnugg, University of Georgia; Jennifer Kung, University of Chicago; Michael Venus, Louisiana State University; and Kelcy McKenna, Arizona State University. Kelcy kept a blog during the event which is available on the ITA website, along with the results.